I was just going to fold the recipe for these meatballs into an upcoming post for bun (coming later this week! ), but then I figured that they’re definitely special enough to merit their own post. I think I’ve made at least a couple hundred pork meatballs over the past couple weeks in search of the perfect version. 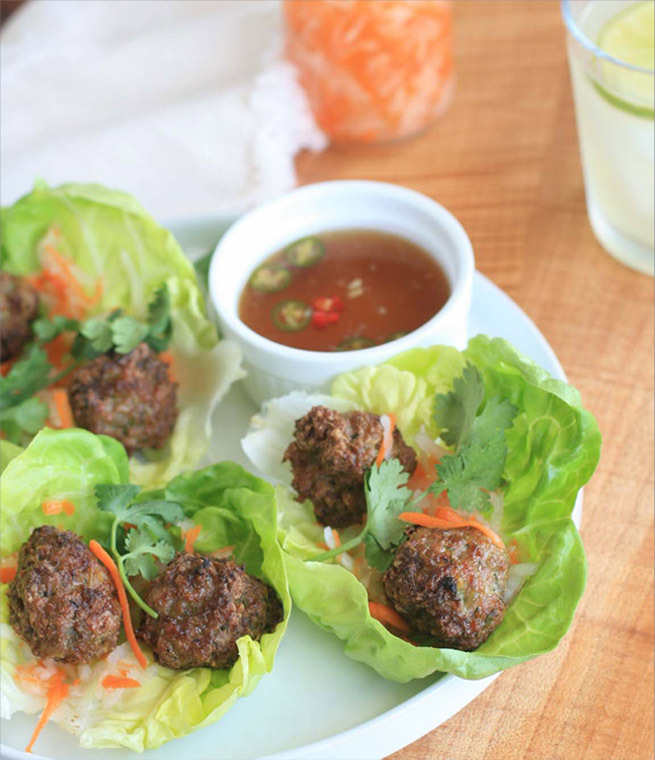 I wanted a meatball that’s quick and easy to make that would work well as a component in various other dishes (such as lettuce wraps and bun/noodles, both pictured below), but also be special enough to be a stand-alone appetizer. I think I think I finally nailed it, if I do say so myself. Ground pork is combined with garlic, lemongrass, fish sauce and sugar for a touch of sweetness; the pretty green flecks are courtesy of green onion and fresh cilantro. Finally, a bit of baking powder provides lift and a bouncy texture. One word of warning: you’ll probably want to double the batch- it’s hard to keep from snacking on them after they’ve been pulled out of the oven! Combine the garlic, lemongrass, fish sauce and sugar in a food processor and process until the garlic and lemongrass is very finely minced. Add the pork, green onion, and cilantro and pulse until the mixture is combined and the green onions and cilantro are finely chopped and incorporated into the mixture. Scoop the mixture out into a medium-to-large sized bowl and add the baking powder. Mix thoroughly. 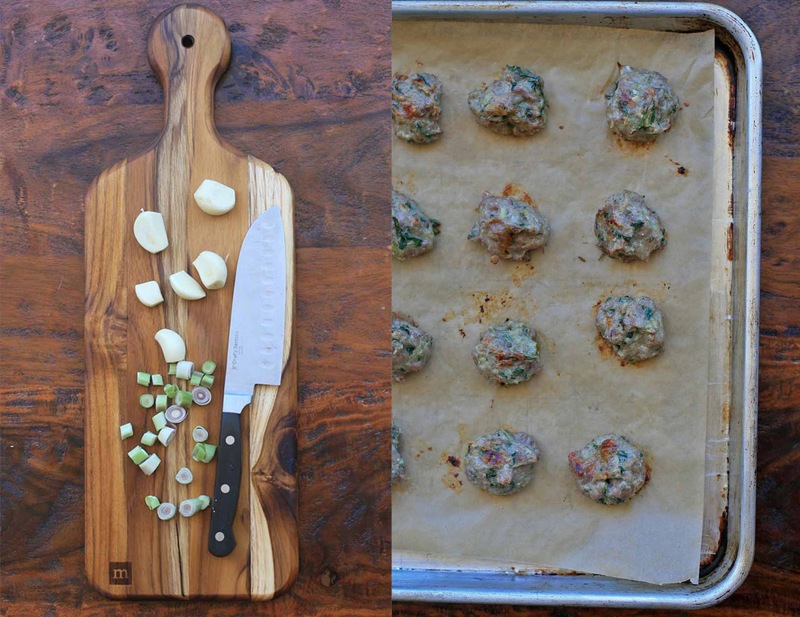 Use your hands to roll into 20-24 meatballs. 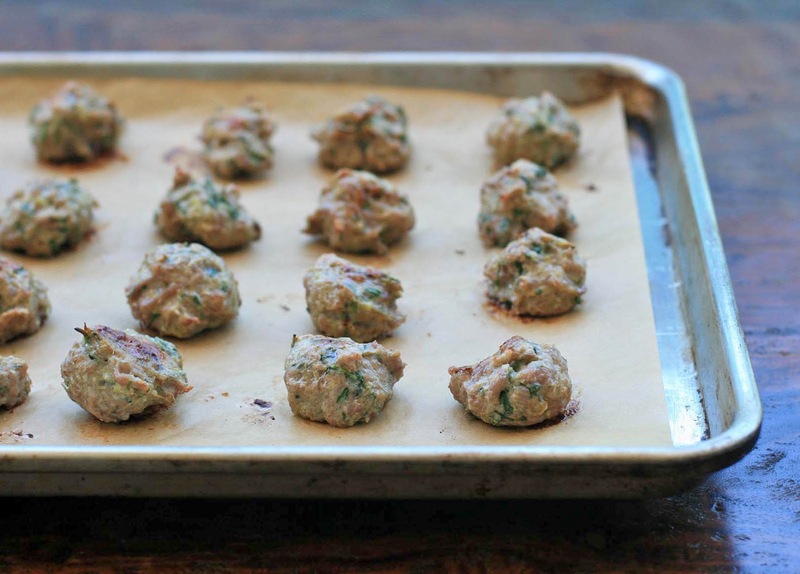 Bake for approximately 20 minutes, flipping the meatballs halfway through baking, or until the meatballs are lightly brown and cooked through.